Nocino color turns black as night. 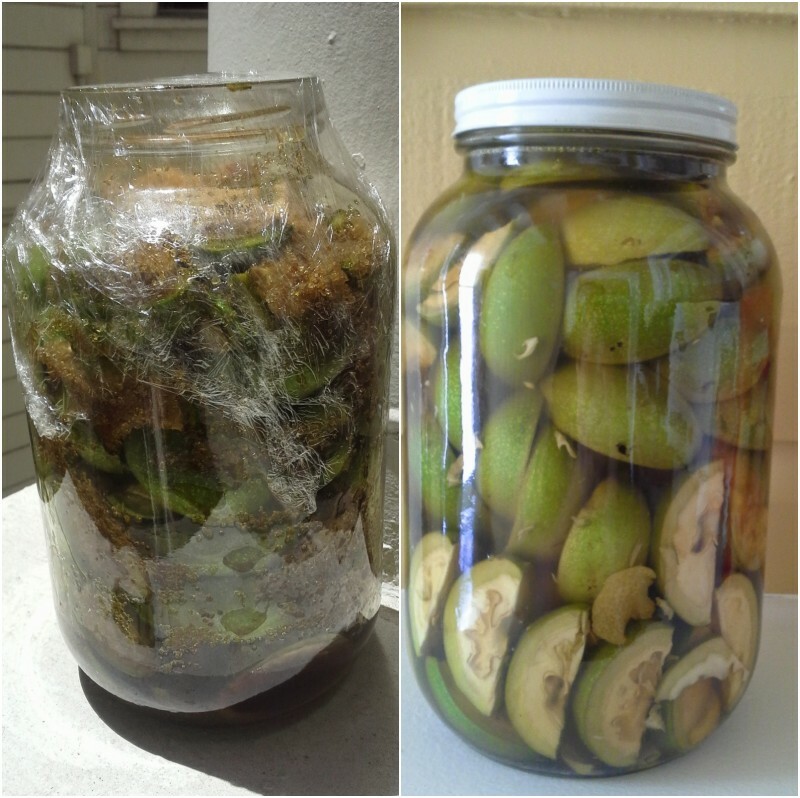 Two months ago I wrote about beginning the process of making homemade nocino, an Italian walnut liqueur. Well the day has arrived to decant the two jugs of nocino into smaller jars. Over the past two months these walnut, sugar,and alcohol mixtures have transitioned from greenish brown to an almost black liquid. As an aside, the pigment from walnut skins has been used for centuries as an ink and dye and, as I found out, if you spill some on your kitchen counter without wiping it up right away, it will stain that too. One of the primary distinguishing factors of one nocino to another are the spices used to flavor the liqueur. I looked at a number of recipes and the four most common spices were cinnamon, clove, vanilla, and lemon peel. The nocino that Bill Owens gave me was flavored with cinnamon and star anise, which from my research is an unusual combination but it tastes really good so I decided to add it to my list of spices. One important decision at this point was to determine which of the three common varieties of cinnamon to use. When I created my spirit aroma kit I included two different types of cinnamon so I turned to it for help. The Vietnamese cinnamon has a pleasant yet spicy note like cinnamon and maple syrup over oatmeal, while the Ceylon cinnamon was hot and sweet like a fireball candy. For the nocino, the Vietnamese cinnamon seemed most appropriate. Another part of my experiment was to make half the nocino with lemon peel and half with out. In the pictures above, the jar with the white lid also included lemon peel. When I tasted them, both were still pretty bitter but the nocino with lemon had a much dryer finish. Finally, before I began the process of decanting each jug into smaller jars I decided on a couple of spice combinations to see what I like best. 1. Cinnamon & Clove 2. Cinnamon & Star Anise 3. Cinnamon, Clove, Star Anise, Vanilla 4. Vanilla & Star Anise 5. Lemon, Cinnamon & Clove 6. Lemon, Cinnamon & Star Anise 7. Lemon, Cinnamon, Clove, Star Anise, Vanilla 8. Lemon, Vanilla & Star Anise. After I filled the jars with the right spices labeled and labeled them I strained the contents of the first nocino jug into a large glass dispenser with a nozzle that made filling each jar really easy (this was my wife's idea). I'd like to say this went smoothly but I made a bit of a mess with nocino spilling and splashing on the counter top and floor. But, once the first jug was decanted I filled and topped the first four spice experiments. With a little left over, I decided to fill a half pint jar without any spices to see how the nocino ages just on its own. Decanting the second jug of nocino went a little smother than the first time but there was still some spillage from one jug to the other. Despite looking fuller, the second jug, which had the lemon peel, contained a little less fluid and I was only able to fill 3 and 3/4 pint jars (pictured in the gallery below). Now the jars of nocino with their labels fix and lids securely screwed on were placed in a cool dark corner of our apartment to age for another eight months. Once the eight months has elapsed I will taste them again and hopefully settle on a single recipe that I like the most. If the bitterness has smoothed out enough I will think about proofing them down a bit, bottling and giving them away as gifts. In the mean time I will continue to enjoy the nocino I have in my cabinet and dream of next year's harvest. Pint Jars, 2 gallon jugs of nocino, spices, and a large jug with a nozzle for decanting. These jars will sit in a cool dark place for another 8 months before bottling.